So you visit a website, let’s say… a Halloween costume shop because you are looking for the perfect spandex bodysuit to play your favourite super hero. The next time you log in to Facebook, you’re seeing ads down the side of your page and stealthily snuck into your News Feed. These ads are full of spandex body suits. And latex. And worse. You only needed a spidey costume! Your browser has tracked your surfing activity and fed it back to Facebook. Do you feel violated yet? The page will automatically begin scanning the browser you are using for companies that are tracking your activity and reporting it to Facebook to generate ads. When the scan is complete, you will see a list of companies that have been participating in this on your computer at your expense. Here, you want to check the “Select All” box, then submit your choices at the bottom. I have selected the 3rd tab here to show companies that are no longer tracking what I do for advertising (and God only knows what other purposes). As you can see, 118 companies were found in this case to be tracking activity. 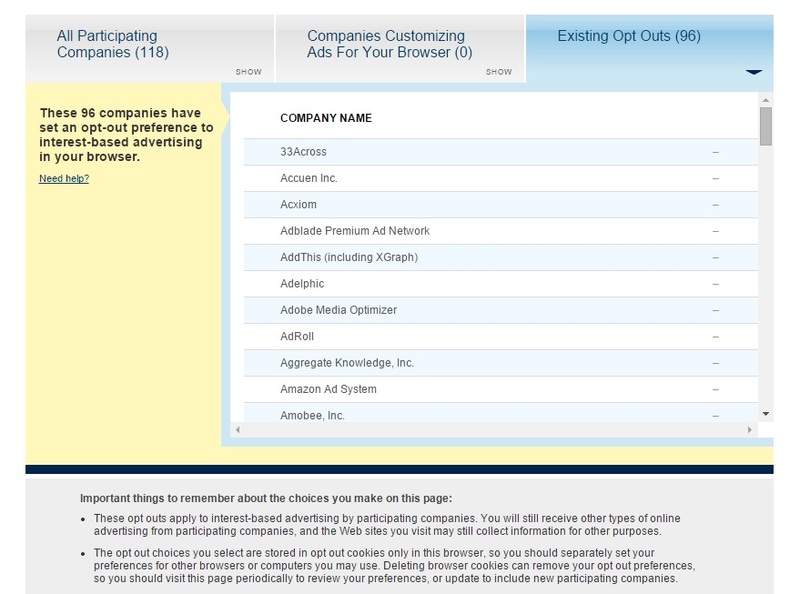 Of those, one “could not be communicated with.” 96 of these companies had an option to “opt out” of their tracking based advertising. The rest had no available opt-outs. Still, there are now 96 companies that are no longer tracking me for Facebook ads? I’ll take it. Of course, this will not get rid of all of your Facebook ads – they have to stay afloat somehow and advertising is their primary source of income. However, you can feel a little bit better about your privacy and that in itself is worth a few clicks. As my Kindle Fire and I approach our one-year anniversary of being together, I become aware of how dependent on the device I really am and how much it has come to mean in my daily life. I received the Kindle Fire as a birthday present last year and first thought, “Now this is a neat new toy.” Little did I realize how streamlined such a tiny tablet could make my daily routine. At the bottom of the home screen on my virtual shelves of favorites, my mornings and evenings are lined up for quick access. I check and reply to my e-mail, check my calendar, the weather, local and national news, play a couple rounds of a popular word puzzle game, and finally check my Facebook and Twitter feeds for messages or anything else of importance. Within a few minutes, I have all the information I need to get on with my day. Repeat the same process at night, and then settle in with the next few chapters of whatever book I’m currently reading. During the day, I even use it to take hand-written notes on schedule changes, class and work notes, to-do lists, story or article ideas, etc. After a year of daily use, I still go to bed amazed that all this is at my fingertips, instantly available. Maybe it is because I grew up in the 70s and 80s accustomed to going out to retrieve the newspaper every morning from the lawn, looking forward to magazines in the mail, reading comics on Sundays and clipping coupons with my mother. The faster technology grows, the harder it seems to be to let go of such deeply rooted habits that formed before such things even existed. Those of us in our 30s and 40s however seem to be finally – slowly – giving in to the conveniences that digital media offers. As we find we have less personal time than in years past and a higher demand for instant information, we are starting to turn away from print media and opt for more advanced tools and resources. So where does the digital domain leave traditional print media? This is a topic of heavy discussion and concern that just keeps getting bigger. A recent study also entitled “The Future Of Print Media” indicated that From 2007 to 2009 revenue change in newspaper publishing, including advertisement, sales and other sources of income decreased 30 percent in the United States, 21 percent in the United Kingdom, 20 percent in Greece and 10 percent in Germany (Boghani, 2012). This year the New Orleans Times-Picayune cut its newsroom staff practically in half and reduced its service to only three days a week (Carley, 2012). The same fate may loom for other print-run media such as The Recorder and the Orange County Register as well as other small papers across the nation as publishers continue to see interest and sales falling from an audience leaning toward obtaining their news digitally. Newsweek, a weekly paper launched in 1933 by Thomas J. C. Martyn, announced in October that beginning in January 2012 it will transition to all-digital (Boghani, 2012). While some printed options disappear, others are determined to supplement their lost print revenue with digital revenue. The New York Times and The Washington Post have broadened their reach into the digital world while remaining in print. The Washington Post for example has experimented with the Trove recommendation engine (Ingram, 2012). The Facebook social reader has also become an option for expansion for media companies with the support and ability to explore other avenues to reach their readers. As traditional readers age and technology advances, adaptation on the part of both publisher and consumer is the best compromise. Print media publishers must find new ways to reach an audience that increasingly demands digital content and readers will need to come to terms with the inevitable – that technology is progressing and changing the way we live. For younger generations, this transition from print to digital will likely be a non-issue as they have been raised in technologically advanced homes and classrooms. For the older generations, it may be a bit more difficult to acclimate to the new ways we have of getting our information. Ingram, M. (April 16, 2012). The Future Of Media: Many Small Pieces, Loosely Joined.